When I headed across the Nevada border for my most recent Las Vegas vacation, I thought that the only things to do in Vegas revolved around gambling, seeing a few shows, and gorging on the buffets. Most (okay, all) of my previous Vegas vacations revolved around The Strip. I'm perhaps a little embarrassed to say that I didn't even know what else there was to do besides hanging out on The Strip. Luckily, I knew that for this Las Vegas vacation, I'd get to see a side of Las Vegas that most tourist don't see. I was visiting friends who lived in Vegas. People, you might say, whose sanity depends upon finding something to do other than gambling, the shows, or the buffets. They shared with me a world of stunning desert beauty that I would now like to share with you. I hope you venture away from the bright flashing lights on your next Las Vegas vacation to witness the haunting beauty of the Nevada desert. Then, I'll share with you three great timeshares that you can rent in Las Vegas. At the bottom of this page, there's also a place where you can share YOUR advice on the best things to do on a Las Vegas vacation! Our first itinerary takes you through the desert into nearby California where you'll visit a Coptic Orthodox Monastery, marvel at the world's tallest thermometer, enjoy lunch at an (infamous?) Greek restaurant, and walk barefoot in soothing sand dunes. Warning: All told, you'll be in the car for almost seven hours. It's a beautiful drive, but be sure to bring plenty of water and snacks with you. When we went, we stopped at a grocery store first to pick up bottles of water, juice, plus a few muffins. Though I love chocolate, I was careful to not bring any along - I was afraid it would melt! Our first stop is the Saint Antony Coptic Orthodox Monastery (43725 Bragdon Road; Newberry Springs, CA 92365 760-257-1204). Take the Harvard exit, Exit # 206. Turn right on Harvard Road. Take the first left onto Hacienda Road. The road soon turns into Barrett Road. Travel for almost 2 miles. Turn right onto Mountain View Road. Travel for half a mile. Turn left on Warbonnett Road. Travel one mile. Take the first right onto Bragdon Road. Travel for one mile. The monastery will be on your left. You should be able to see their new church. At the end of the ramp, make a right turn. At the Stop sign, make a left turn into Yermo Road. Turn left onto bridge. This road is called "Coyote Lake Road"
Turn left on Bragdon Road, which is a dirt road. The monastery will be on your left. When we visited in late 2010, the interior of the church was largely completed, but the exterior grounds were still under construction. We wandered past the date trees at Saint Antony Coptic Orthodox Monastery and discovered a veritable zoo in the back with ducks, rabbits, emus, peacocks, and lambs! When leaving the Monastery, simply return the way you came and get back onto I-15, but this time go north. We're now headed to Baker for lunch. Stay on the 15-North for 38.9 miles and take exit 245 for "Baker Blvd/I-15 BUS N." Drive 1.6 miles. 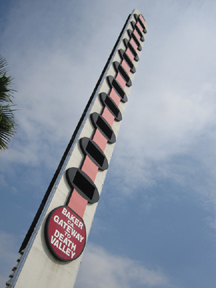 By this time, you should begin to see the famous World's Tallest Thermometer on the right side of the street just past Bob's Big Boy. We like to stop there for pictures before we eat. 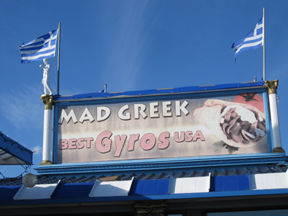 You probably saw The Mad Greek on your left as you headed for the giant thermometer. It's just a tenth of a mile back on Baker Blvd. There are a number of things I love about the Mad Greek. First of course is the way it's decorated. It's kind of a "whatever Greek" look where anything that even remotely references Greece counts as appropriate decorations. Another thing I love about The Mad Greek is that if you have a Commercial Driver's License (as I do), they'll give you a free soda. You don't even have to buy anything to get it. It's totally free. After you've finished your lunch, it's time to hit the road and head over to the otherworldly Kelso Dunes. Turn right when you pull out of the parking lot onto Baker Blvd and immediately turn left onto CA-127 S/Death Valley Road. The road quickly turns into Kelbaker Road, which you'll stay on for 42.3 miles. Turn right onto Kelso-Dunes Road. After about 2.9 miles you should see a small parking area on your right. Kick off your shoes and enjoy a spa-quality foot massage as you amble through the sand dunes. You can walk for quite a ways back into the dunes. Because the terrain is relatively flat, you don't have to worry too much about getting separated from your party. Even if you can't see them, it's likely that they can still hear you. This is a breathtaking place to watch the sunset and the moon come out. Ahh, what a relaxing day. Now it's time to head back to Las Vegas for a little shut eye! Return east on Kelso-Dunes Road for 2.9 miles and take a left onto Kelbaker Road. After 7.8 miles, take a right onto Kelso Cima Road and travel for 19 miles. Veer left onto Morning Star Mine Road and drive for 14.8 miles. You'll come to a T in the road. Take the left onto Ivanpah Road and go 3.2 miles to Nipton Road. Take a left on Nipton Road and after 3.4 miles you'll be back on the I-15. Turn right to go north. Another 45 miles and you'll be back in Las Vegas! After Itinery Number One, are you looking forward to a shorter, more leisurely day with a lot less driving? Itinery Number Two is a great way to spend the day when you find yourself sleeping in on your Las Vegas vacation. 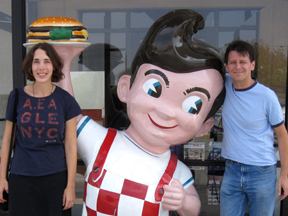 Today's itinery includes comfort food, petroglyphs, and majestic towering red rocks. I think that a big part of a Las Vegas vacation (or any vacation, for that matter) is sleeping in. This itinery accommodates this important facet well! Enjoy a late breakfast over at the famous Bagel Cafe (301 North Buffalo Drive, Las Vegas, NV 702-255-3444), voted The Best Bagels 12 years in a row from 1997 to 2008. I normally don't even like bagels, and I think it's because I haven't been eating real bagels. What's a real bagel? It's boiled before it's baked. The result is a sublime texture, lighter and less "bready" than a non-real bagel. And even if you don't like any bagels (even the real kind), I still encourage you to give The Bagel Cafe a try - they have plenty of other things to feast upon, including omelets, waffles, eggs, soups, sandwiches, pizzas, chicken, and a lot more! If you like, you can pick up some fresh bagels for the road from their deli case before you go. Now we'll drive over to Calico Basin/Red Spring to spot a few ancient petroglyphs. When leaving The Bagel Cafe, make a right our of the parking lot and go south on S. Buffalo Drive for 1.2 miles. Turn right onto W Charleston Blvd and drive for eight miles, then take a right onto Calico Basin. Drive another 1.2 miles until you come to the Calico Basin/Red Spring parking lot. Take the wooden boardwalk trail on the loop around Calico Basin. Once you reach the mountains sides, you should be able to spot the ancient petroglyphs...and maybe even a waterfall! Return on the road you came in on and turn right on NV-159 W/Charleston Blvd. You'll see signs that read "Blue Diamond." After just 1.4 miles turn right at the sign for the Red Rock Canyon National Conservation Area. This is a National Park and therefore has the National Park fee. If you're a National Park Annual Pass holder (like I am), you'll feel smart when you whip out your card and drive right on in. As of this writing, it costs $7 to drive in on a Day Pass with a car. There are a number of hikes that you can take at Red Rock. The hiking trails include everything from a .7 mile children's trail to an eleven mile trail best left for experienced and prepared hikers. The Ranger can provide you with a map and more information when you enter. While you can also camp at Red Rock, we simply took the Scenic Drive tour. The scenic drive makes a big loop around the conservation area. There are plenty of places to get out along the way to take pictures. I wanted to share with you a taste of the beautiful sunset you'll experience if you drive south on Interstate 15 towards Los Angeles. If you don't have friends to stay with in Las Vegas, consider staying in one of my three Las Vegas timeshare rentals. Yes, Las Vegas abounds with hotels and motels. Timeshares, however, are a little nicer. With kitchens and multiple rooms and plenty of space, they're more like condos. Click here to check availability. Click here to check availability for all three timeshare rentals. Okay, okay, I loved our day trips, but even I admit that it's not really a Las Vegas vacation if you don't at least walk along The Strip and watch the Fountains of the Bellagio. We watched the towering streams of water dance to the song "God Bless the USA." What's Your Favorite Thing to do in Las Vegas? What do you recommend that someone do on their vacation to Las Vegas? What restaurants should they try? Where can someone take the most beautiful pictures? Looking for some fantastic Las Vegas restaurants?